Emily Freeman’s house sits at the top of a cul-de-sac at the end of a street in a neighborhood comprised of young families and empty nesters alike. As you might expect, this big, paved turnaround of her typical American neighborhood became the place for all the kids who lived around it and down its street, to congregate and play. Even the parents would gather in its center, pulling out lawn chairs from their garages and spreading out blankets on the ground to watch them. One afternoon while John’s mom was visiting, she mentioned how nice it would be to have a couple of benches in the center of the circle for more permanent seating so we wouldn’t always have to drag our lawn chairs out every time the kids wanted to play. Not one to suggest ideas without taking responsibility, she showed up several days later with a bench in a box in the back of her car. Days later, a neighbor bought a matching one. Now we have two benches facing each other in front of our houses, like our little community of seven homes finally has a living room. As I was preparing dinner one afternoon, I glanced out my kitchen window and noticed three of our neighbors leave their homes at nearly the same time, making their way at various shuffling speeds to meet at the benches in the middle. I’d seen them outside in the past, chatting over newly fetched mail or exchanging comments about the weather, but they had never stayed out for more than a few minutes as their aging bodies wouldn’t cooperate with the demands of standing for so long. Now that we had benches, everything was different. Unable to resist the community, I went outside to check the mail and crossed the street to talk with them for a few moments. We spoke of children and grandchildren, aging siblings and friends, the weather. We enjoyed the breeze and waved at the occasional passing car. We lingered. With dinner still cooking inside, I made my way back to the kitchen but kept my eye on them through my window. They stayed out for nearly an hour. I’d not seen them do that before. It wasn’t that they didn’t want to be together, but before it wasn’t so easy. Now they had benches to sit on. And the benches made all the difference. The benches didn’t give them something to talk about. The benches weren’t fancy, expensive, impressive or flashy. They weren’t a complicated solution to an unsolvable problem, and they didn’t offer answers to difficult questions. The benches simply gave us neighbors a place to be, to rest, a place to come together on an ordinary day. A few benches made all the difference on Emily’s street. 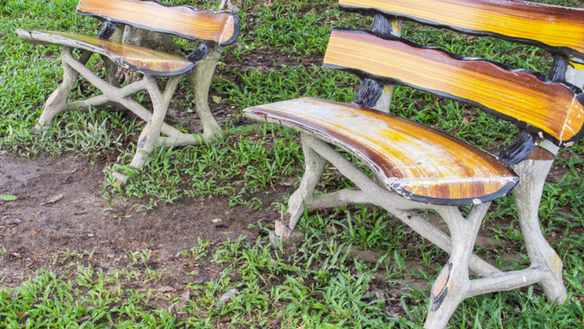 Have you ever thought about how setting up some benches–literally or metaphorically–in the midst of your ordinary, daily life could open the ways to relationship and sharing the gospel? What can you do to encourage community right where you live, work and play? Where can you set up some benches? Who have you noticed that you think you could invite to join you there? What kinds of things do you imagine you’d talk about? We’d love to hear from you! Post your comment–let us know how your bench dwelling is going!